* Human evolution in high gear, John Hawks again, plus others. * Nazi anti-American poster. I think this is what a Fair Folk behemoth looks like. * Steven Pinker on infanticide. Old. * Haldane's On Being the Right Size. "A horse splashes." * Economic records. I liked a comment further down: "Free markets don't work. Competition works, and that is the point and role of government regulation: to preserve competition." I'd say there are other points to regulation as well (externalities!) but preserving competition -- free markets have a tendency to monopolize -- is a good one. * I spent hours reading old entries at philosophyetc, such as this, this, this, and this. * GM is apparently killing the Saturn, and maybe Saab, but also the Hummer. So I'm told; I don't care enough to google. * US has fewer cars per capita than other countries?. One suggestion elsewhere was economic inequality, and more Americans who can't afford any cars; another was that the data doesn't count all the minivans and SUVs. 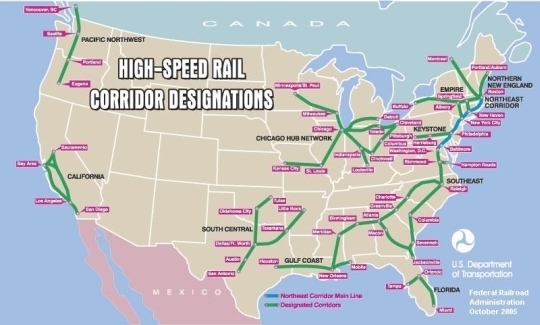 * US high speed rail corridor designations. Note the lack of connection: Seaboard to Florida or the Midwest, Midwest to Texas, Texas to the Gulf/Seaboard. Of course, AFAICT none of this has been built anyway, apart from the blue line in the NE. * Bristol Palin: abstinence isn't realistic. 1) Map seems to be designations, not built track, outside of the blue NE; I'll edit. 2) Not having a feel for the proper density or reach of high-rail, that actually wasn't my first thought. Tennessee gets skipped, as TN and KY do by Amtrak; the geography might have something to do with that. Otherwise most states that aren't The West get touched, at least.